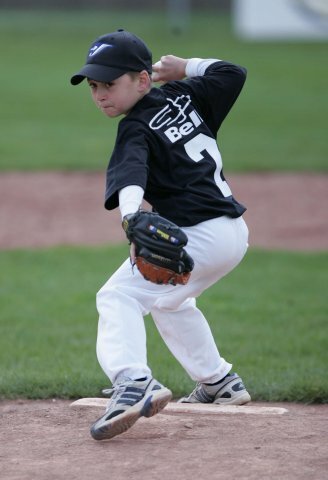 Prior to the start of each season, all players who will be playing in the Minor Division based on their Little League age, will be asked to attend an indoor evaluation of their skills. A number of drills will be conducted to assess the players ability to catch, field, throw and bat. The assessment will take between 30 and 45 minutes. Based on the overall evaluation of the players skill they will be assigned to one of three Minor divisions comprised of Minor National West, Minor National East, and Minor American. This division will feature the use of a pitching machine for the duration of the season, allowing players to get used to seeing a ball pitched with a fair degree of consistency. This will allow the players to develop confidence to face balls pitched to them, versus hitting a ball off the tee. The use of a machine will also ensure that pitches are delivered consistently to the batter ensuring they can develop good batting skills. This division is considered a developmental Division and Coaches’ are encouraged to emphasize player instruction and development. This is the first year where pitching is introduced. Each player must play a minimum of three innings in a six-inning game, based on the OLL Fair-Play Model. Ten (10) players are assigned to field positions each inning, and all roster players bat whether assigned to a field position or not. Game scores and standings are recorded. Upon completion of the regular season, a post-season playoff tournament is held. The top 2 teams from this tournament play games on Championship Day and receive trophies. Like the Minor National West Division, teams will start off the season using a pitching machine and will progress to live pitching as teams progress with developing pitching skills on their teams. The use of live pitching will be introduced on an incremental basis e.g. 4 innings Pitching Machine and 2 innings live pitching and progressing to the point where live pitching will be used for the whole game during playoffs. 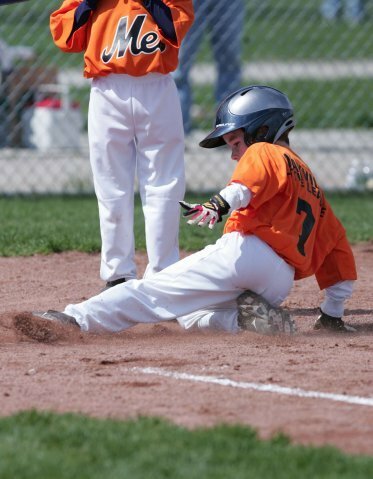 Each player must play a minimum of three innings in a six-inning game, based on the OLL Fair-Play Model. Coaches focus on developing individual and team skills to field a competitive team. Game scores and standings are recorded. This Division is the highest level in the Minor Division which will use live pitching throughout the season and will be divided into the AL East and AL West divisions based on evaluations. Minor AL is the highest level in the Minor Division. All players on the team bat in a continuous batting order. Each player must play a minimum of three innings in a six-inning game, based on the OLL Fair-Play Model. Coaches focus on developing individual and team skills to field a competitive team. Game scores and standings are recorded.